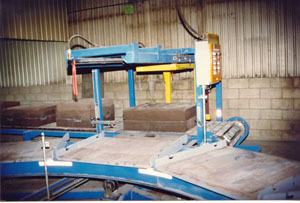 Transfer Tables - Quiptec Inc.
A 12-Station pouring turntable for "no-bake" molds of various sizes and weights, up to the 2000 lbs capacity. Specifically designed to minimize potential damage from pouring spills. 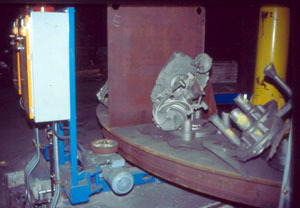 This six-station turntable was designed to reduce noise and dust from the arc air cut-off in the customer's finishing department, as well as reduce manpower requirements.